Looking through a polarizing filter, you can see how it darkens the blue sky. Photographs taken of a lake, on the left, without a polarizer, and the photo on the right, with the use of a polarizing filter. See how the polarizer darkens the blue sky as well as the water and even brings out the green color in the foliage. These photos are great examples of the difference that a polarizing filter can make on a photograph. The image on the left shows glare on the lily pads. The flower is dark and the water not very transparent. In the image where the polarizer was used, you can see the green of the lily pads, the flower is brighter and you can see detail beneath the water's surface. The photo on the left was taken without the use of a polarizer filter. Note how the foliage is more saturated in the photo on the right, when the polarizing filter was used. The water is also darker blue in this image. A photograph taken of the items in a store window. Note the glare that's visible in the image on the left, and how it disappears in the photo on the right, with the polarizer on the lens. Given the choice, you'd rather have the skies in your pictures a rich blue rather than a pale shade of washed out, right? Well, you are given the choice when you add a polarizing filter to your arsenal of imaging accessories. Polarizing filters (often called polarizers) can help you out in another way, too: they can reduce, and sometimes even remove, unwanted reflections from your images, and in doing so often increase color saturation. But mostly they're used to make blue skies bluer and clouds stand out in dramatic fashion. It's no wonder that outdoor and nature photographers won't leave home without them. 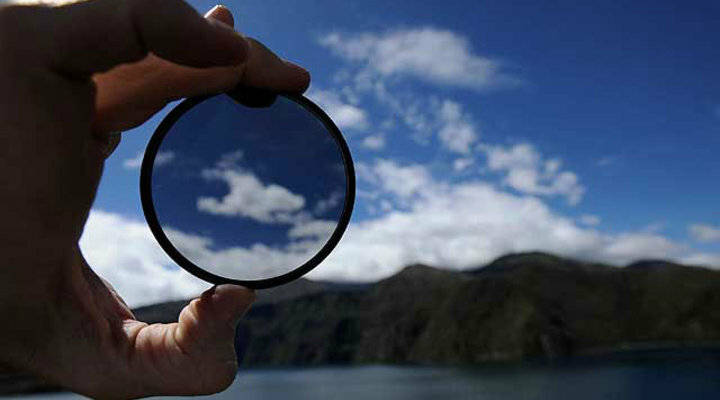 A polarizer is actually two pieces of glass set in a filter ring that screws onto your lens. The outer piece rotates, and as you look through the viewfinder you'll see the effect of the rotation. Polarizers are often ideal for increasing color saturation and cutting reflections during early-morning shooting when water droplets on flowers or grass or mist in the air scatters light and obscures some of the true color of the scene or the sky. A polarizer can also make a rainbow more visible and help out when you're photographing foliage by reducing reflections on leaves. Nikon makes a line of circular polarizers designed to be used on our NIKKOR autofocus lenses and with our DSLR and Mirrorless cameras—which means they are made specifically to work within the Nikon system. They are exceptionally thin, optically perfect and range in size from 52mm to 77mm in diameter so they'll fit all NIKKOR lenses. Be sure you specify circular polarizers, though: they're made for today's autofocus, autoexposure cameras. Though a polarizer is handy and versatile, it's not recommended that you keep it on your lens all the time. It will darken your view of the scene (it cuts down 1.5 to 2 f/stops of light), so if you're not out to banish reflections or increase color saturation in the sky—or in water—it's best to take it off. That loss of light isn't anything to worry about when you're using a polarizer for a specific purpose, though. Your camera's meter will read the light coming through the lens and adjust to provide the correct exposure. When using your polarizer to darken the sky, the direction in which you shoot is the key to getting the most dramatic effect. Here's what to do: hold your hand in pistol fashion with your index finger and thumb as the barrel and hammer, respectively. Point the barrel at the brightest part of the sky, and the hammer will be pointing at the area of the sky that will be most affected by the use of the polarizer. Seeing is believing, so the best way to appreciate what a polarizer can do is to take your Nikon DSLR or Mirrorless camera and a favorite lens down to your nearest dealer on a sunny day and try one out. And polarizers are just as effective when you're shooting D-Movies with your Nikon camera as they are when shooting stills—and you'll see the effect of the polarizer in Live View. An Easy to Use Accessory, Polarizing Filters Bring out the Color and Definition in Your Photographs.